The tour bike used on this trip is a 21-inch 2000 model year Trek 520, often referred to as a classic steel touring bike tuned for maximum comfort, reliability and stability. Trek spent three decades fine tuning this model to suit the high loads and many miles of multi-day touring. The company calls it a 'bomb-proof" frame with a "steel-smooth" ride. The Trek 520 supports a comfortable upright riding position and does the job. It is stable even when fully loaded yet still remains lively when riding. As to be expected, the steel is stiff with good power transfer and handles bumps well. The only compromise of the chromoly high-carbon steel frame is the heavier weight, but the gearing mitigates this issue. As a quick comment for bike touring neophytes, be aware that bike touring requires bikes designed for the task, especially the task of carrying heavy loads (for example, 100 pounds of bike/gear and 180 pounds of rider weight). 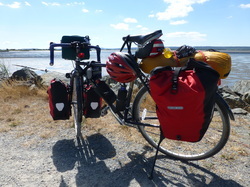 Many non-touring specific bicycles fall apart under the demands of loaded bicycle touring. A non-specific touring bicycle will get frequent flat tires, be susceptible to multiple broken spokes, and in some instances, the frame of the bicycle itself will break apart (which is very dangerous). Upon completion of the tour, further comments on the performance of this touring model will be reviewed. The rear rack is the stock Trek supplied rack which works fine. If it ever breaks, it will be upgraded to the Tubus rear rack. The best selling Tubus lowrider Tara front rack has been improving over the last 17 years and is well known as the indestructible burro. A Planet Bike Super Flash LED red light was attached to the back of the rear rack for safety. The pump used is a Topeak Road Morph G. It has built in pressure gauge an the presta connection does not leak while pumping. The attached flexible hose makes filling handier and the fold-down foot pads makes pumping easier. A bracket is supplied with the unit but it was retrofitted with a bracket from another brand which shares a water bottle cage. A kickstand is an essential piece of gear for a touring bike. The Greenfield Stabilizer rear kickstand is well able to support a fully loaded bicycle. It naturally forms a very stable tripod with the two wheels (the front wheel rolls around a bit to find its neutral position). A Chums Surfshot wallet comes in handy on a bike tour because it is lightweight and compact. It has ID window pocket and two zipper pockets. For user reviews of the Trek 520 go to the Adventure Cycling Association Forum.